@killerbob, so if one goes this route, then one buys the 1510 case "empty", no foam, and then buys this insert for $90.00 from TrePak direct or $200.00 with case and insert, and then one is done correct? except....The lid liner, and laptop insert (does this insert fit in the lid, so one either has the laptop insert in the lid, or the photo gadget mesh insert not both) is also extra, and that is a pelican item, not a TrekPak form what I can muster correct? I got the Peli 1510, with two lid liners, the photographers and the laptop one. Then I ordered the 1510 insert package from TrekPak. I didn't know I could have gotten the case and insert from TrekPak, and then the two lid liners from somewhere else. They two lid liners were a lot more expensive than $8 though. Especially the laptop one. $200 from TrekPak is a good deal, but I would have had to pay for shipping from the US, whereas I could easily find the Peli 1510 in Denmark. Porta Brace makes an insert for a 1650 pelican case. I use it to ship gear with and it works. The only grief I now have is that I am not able to carry my flash kit (SB-900, RRS bracket, SC-29) along in the Peli while I also have my 80-400mm in it... I really tried jigging it around, but it won't fit. The bigger Pelis get too big, and then you have no chance getting it onboard as carry-on. @Killerbob: You have too many good stuff...that is your problem :P You may have to pick and choice what to take and what not to take. I will tell you this, if you are not shooting a party or a large gathering...your flash will not be needed on many adventures. Moreover, if you do need one, you may want to invest in the new SB-300 or SB-400. Lastly, if you think that one bag is going to do it all for you...think again. I have about 3 different bag/travel cases to date. Each serving their own unique purpose in relation to what I intend to take on a shot for a the day or longer. I know one thing for sure, I will NOT check my bag in at the airport and trust those airport handlers with my gear. Moreover, they know what to look for and when they see a Pelican case they know that most likely their is photo gear in them, thus more of a target for theft....or as they like to put it...missing. One of the reasons I went with this case, was because it is more discreet, has a nice locking system, and looks like a normal luggage bag. And like the 1510 it too fits in the overhead as a carry on. Oh, I have the Peli for travelling and for storing my gear day-to-day. I have a LowePro Flipside 500AW for going out into nature etc., as well as the LowePro street gear (Tech. belt, Toplader, Harness, and lens cases) for walking around. Just my two cents concerning the TrekPak insert. I think that for this company to charge $40+ for shipping from Denver, CO by UPS Ground is ridiculous. That's almost half the price of the insert. Has anyone found a source other than the manufacturer? lol - didn't see that. I paid USD55 in USPS shipping from the US to Greenland, which seemed kind of cheap for two inserts. @pippigurl, I just checked shipping rate on a 1510 complete with insert, shipped to me in Atlanta, from CO, and it was only $15.00 shipping with UPS, when you stated $40.00 for just insert, was that an international shipment quote? @pippigurl - I just had a similar experience as @kkanuck. I ordered the TrekPak and Pelican 1510 case from TrekPak and the $200 price was quite a bit less expensive than I could find anywhere else for the items separately. Shipping (ground) is costing me $13.43 to Portland, Oregon. I also found I could buy other Pelican brand accessories for the case less expensively through Amazon than from Pelican direct due to shipping costs. The "free shipping" threshold at Amazon is pretty low if one is willing to wait for up to 8 business days. I bought the Pelican case for several reasons: It is very sound structurally and comes with basically a lifetime warranty. It is dustproof and waterproof within limits. It can be carried on a plane. It is a good storage case. I will still pack one of two bags I own depending on what I am shooting. The Pelican case may come with me on a plane or in a car but I don't see myself shooting out of it, except possibly on some rare occasion. I'll know more when it arrives. @kkanuck no...when I advanced to the checkout page for my order to replace the Pelican insert it listed the $40 for shipping. So I cancelled the order. May circle back next week and email them to determine if this is accurate. Their insert sounds a lot better than the Pelican. I'm looking into a pelican To store my equipment at home/travel by car and to use on a shoot. I rather have a rolling case on those days im solo and don't have help. I currently have three bags: messenger with camera and a prime, bookbag with everything else and laptop and a book bag with the accesories. I wouldn't mind carrying the case and accesories book bag on travel. One of the reasons is now with my additiona of another child I will need that little extra space it will be easier when i travel. I looked at a few and saw some on amazon and missed out on a lighting deal. d800, 50mm 1.8g, 85mm 1.8g, sigma 35 1.4 a, nikon24-70 nikon 70-200 two flash sb-800/900. is the foam good or the rollipak a better choice? For storing at home, in the car, and for traveling, the Peli 1510s are fantastic. Yes, they scream out "Camera Equipment", but most of my travel is small airport -> small airport, and I'm not worried. If/when I will be bringing my stuff on longer journeys, I'll carry-on it. If you get it from TrekPak directly, they'll make it on time. Unfortunately I don't think you can get the other Peli inserts from TrekPak, like the camera/laptop insert. @Golf007sd I Like that bag. Thanks for posting it. I will add that to serious consideration. The only advantage I see on the pelican is the hard case but i'll start comparing shortly. I purchased a Pelican 1510 with the TrekPak insert and I bought it all directly from TrekPak as that was the best deal going at the time. It was shipped promptly and complete. I bought the 1510 because it meets current airline regulations for carry-ons, and will hold one or two camera bodies plus a decent assortment of lenses. I also use it to carry a substantial amount of gear on road trips. I can take six or more lenses with me along with all the other accessory gear and then work out of a bag, either Think Tank Urban Disguise or Billingham 335, while the case remains in the trunk of my car. The Pelican case is very well constructed, very durable, and provides great gear protection but it is also heavy when fully loaded. Good luck on your decision. @Vipmediastar_JZ: Glad you like the bag. But let me be very clear: the TrekPak and Pelican 1510 is a fantastic setup. My dear friend Kkanuck got one and he brought it to Colorado. I was very impressed with its construction. It can with stand punishment that my case would not in very hard conditions. The only thing I don't like about my Pelicans is the need to use two external padlocks. I travel with two of them, so I need to mess with four locks, which isn't very convenient even though I have all of the locks keyed the same. The 1510 is a roller bag so although it's advertised as a "carry on case", if you fly a lot you'll frequently need to gate check the bag (so be sure to bring your locks). "The only thing I don't like about my Pelicans is the need to use two external padlocks. 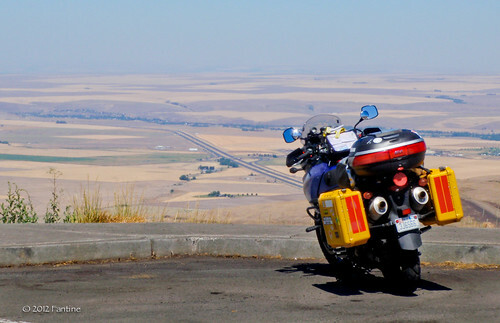 I travel with two of them, so I need to mess with four locks"
Precisely…..had a couple mounted on a Suzuki DL1000 for one of my cross country trips. They are so tuff I could have dumped the bike and the cases would have kept everything safe. Those are great @msmoto I should have gotten visible yellow ones like yours. Instead of foam inserts, I bought a Kata camera bag which fits perfectly in the interior of the Pelican. That way when I reach my destination I can simply pull out the Kata bag and take it with me (vs. lugging the heavy Pelican case which is locked to a removable luggage mount). Ade, I had everything in removable bags as well. Incidentally, this is from somewhere in either Nebraska or Wyoming on my last cross country from North Carolina to Portland, Oregon. There is nothing quite as exciting and spiritual as doing a solo trip across country. My next venture is to sell my current motorhome and get back into an Airstream trailer. And, I may get more Pelican cases for the camera gear so I can slide these into some of the spaces either in the bed of my truck or in the trailer. The nice thing about the hard cases is that one can secure these with steel angle iron and lock them in so no one can steal them. Yet, a simple padlock will release the locking bars and one is ready to go. @msmoto I do not know how to ride a motorbike. However I always wanted to do a cross country on route 30. Sounds like fun. Maybe one day in car with the family.